Long Island City, Queens Co.L.I. A scarce example of Fredrick W. Beers' map of the Long Island City, Queens, New York. Published in 1873. Covers from Hunters Point and Long Island City northward past Ravenswood and Dutch Kills to include all of Astoria. Also includes Blackwell's Island (Roosevelt Island), Hells Gate, Ward's Island, Randall's Island, and Riker's Island. Detailed to the level of individual streets and important buildings. Lists estates and properties in Astoria. Notates ferry crossings between Long Island City and Astoria and the various Islands, including Manhattan. Detailed plans of Dutch Kills and Blissville on verso. 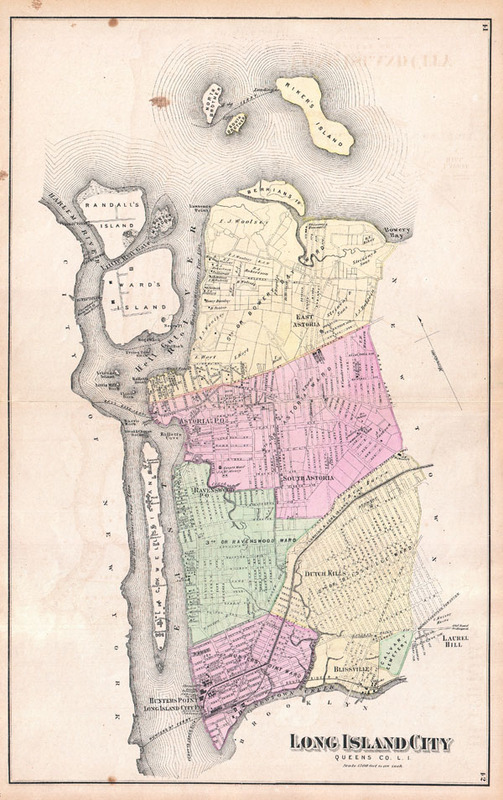 This is probably the finest atlas map of Astoria and Long Island City, Queens to appear in the 19th century. Prepared by Beers, Comstock & Cline out of their office at 36 Vesey Street, New York City, for inclusion in the first published atlas of Long Island, the 1873 issue of Atlas of Long Island, New York. Very good condition. Original centerfold. Maps of Blissville and Dutch Kills on verso.